During face-to-face conversation, you’ll find other person glancing (i.e. rolling eye balls) in certain directions while answering to queries. Even you may find yourself doing the same unconsciously, only if keen attention is paid. If you or the other person is right handed then following would the interpretation of each directional glance if asked query was “What’s your favorite food?” for example. Each mode of information processing has been verbally represented. F) Kinesthetic: Glancing in this direction means person’s checking his/her feelings, emotions and sensations while being queried. You may find person glancing in same direction after asking him/her like “What if we walk to nearby restaurant and enjoy coffee?” or "Are you interested in continental cuisine?" 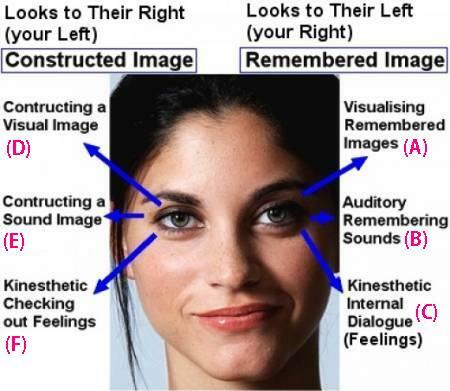 For the left handed person, direction of glance might be reverse for same information processing. Let me be clear that these are general interpretations. Eye movements might differ ethnicity, culture and society wise across the globe. Only close observation and proper querying can help in disclosing true clues they give away. Labels: Interpretation, Neuro-science, Secrets, Why we do? Quite interesting! Quite informative as well. keep it up. Keep posting!! I have read many articles which say that this is not true and just a myth but other articles supporting this this. I do like what you said at the end of your article how this "can differ in ethnicity, culture and society across the globe. "Only close observation and proper querying can help in disclosing true clues they give away." I like that a lot. But it then gives rise to the reliability of these cues. If they are not universal, then can we trust them at all? If we cannot trust them, then what is the use of using these clues? Nevertheless, still very interesting to know﻿.